Just delivered to my doorstep by Betatoys, the long awaited GX-31 Soul of Chogokin Voltes V.
The box is your standard SOC box (9” x 4” x 14”). It’s a bit bigger than the Combattler V box, but not as big as the Dancouga box. Inside are two trays. The Styrofoam tray holds the volt machines in place, and has a cool cover with retro box art. The second tray is clear plastic for all the accessories. Also included is a beautiful color manual, with transformation instructions. Voltes V consists of 5 Volt machines that combine to form the mighty Voltes V.
Volt Crewzer is the smallest Volt Machine, and forms the head of Voltes V. It’s all plastic, and features moveable landing gear, opening cockpit, removable wing blades, and small missiles that show if you tilt the cockpit forward. Volt Bomber forms the arms of Voltes V. The upper arms are metal, but that’s about it. The landing gear is removable and rests on the stand when not in use. The front landing gear retracts into the body. Volt Panzer forms the chest of Voltes V. It features real rubber tank treads, articulated claws, and a small door that opens below the cockpit. The entire body of this vehicle is metal. 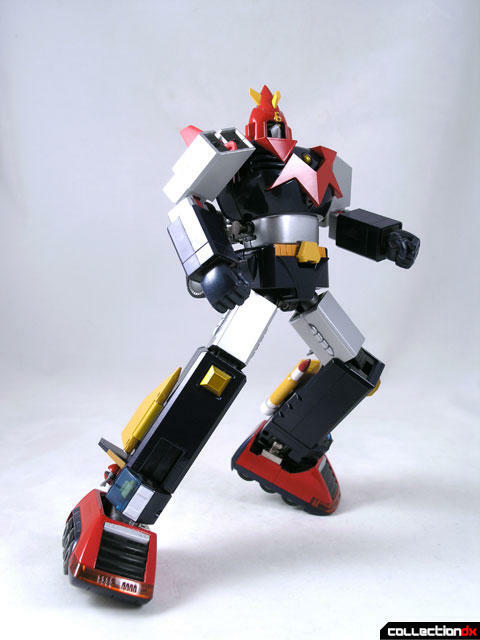 Volt Frigate forms the legs of Voltes V. The lower legs and part of the waist is metal. The Volt Frigate features landing gear and spring loaded turrets. Volt Lander forms the feet of Voltes V. Each vehicle features spring loaded wheels, chrome drills, and moveable antennae. Assembling Voltes is almost self-explanatory. The lander separates and clicks into the bottom of the frigate. Fold the tank treads around the back of the Panzer and attach to the top of the frigate. Unfold the Bomber and insert into the top of the panzer. Slide the sleeves down and pull out the fists. Unfold the Crewzer and attach to the Bomber via a magnetic joint. The combined voltes is sturdy and quite articulate. There is a suprising range of motion in the legs and arms. Unfortunately, there is very little movement in the head, and no articulation in the waist. The toy holds pretty much any pose; nothing seems loose or flimsy. Gatling Missiles – These missiles clip into the hollow arm of Voltes V. Be careful, as those missiles do come off. You don’t want to lose one. 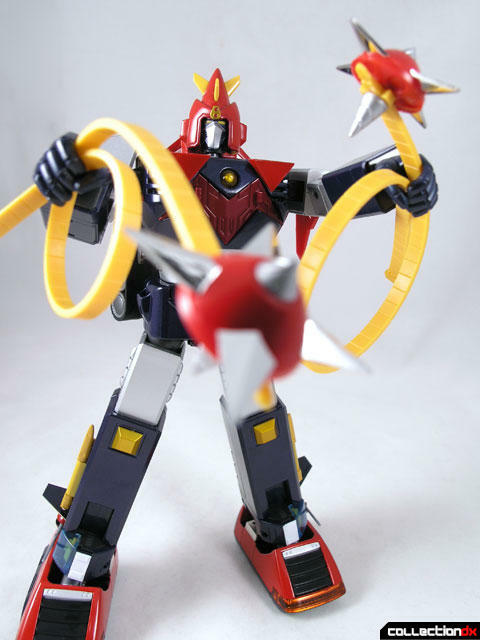 Chain Knuckles – This is a chain assembly that clips into the hollow arm of Voltes V. It has a long metal chain that is attached to a mace-like weapon at the end. In the show this is supposed to shoot, but here it does not. Voltes Bazooka - Voltes’ right arm can be bent to reveal a cannon. The cannon slides out, but be careful not to pop the hand off in the process. Choudenji Strings – These yellow strips are actually supposed to come from Voltes’ belt. To replicate this effect, the yellow belt piece is actually removable and the yellow tab fits into the waist. Tenkuu Ken - Also known as “Lightning Sword” or “Laser Sword”, This is Voltes’ most prominent weapon. 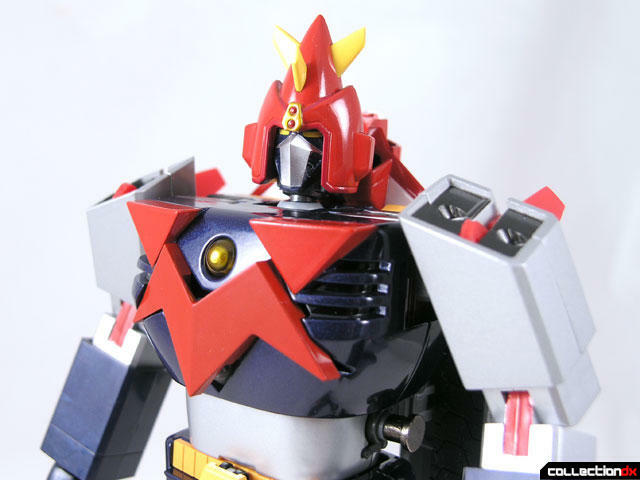 In the show, the Tenkuu ken would appear from the chest of Voltes V, with the red emblem becoming the hilt. To replicate this, Bandai created a folding Tenkuu ken, that can unfold and become the full-sized sword. Unfortnately this sword is flimsy, so Bandai has also provided us with a full sized solid chrome Tenkuu ken. There is also a replacement chest part to insert into the cavity left by the sword. Taka Mecha – Otherwise known as “Mechanical Eagle”, this red bird-like mecha can attach to voltes’s back. An assembly attaches to the bottom that also has a space for the small energy controlling device. In the show, the Taka Mecha delivered the energy controlling device to Voltes V so it could fire the Choudenji Ball weapon. This whole assembly fits into the back of Voltes by opening a small door and moving the tank treads to the side. Variant hands – The hands that come attached to voltes arms are nicely articulated, but look too small in robot mode. By adding caps to the arms, you can attach any one of 3 different fists to each arm. 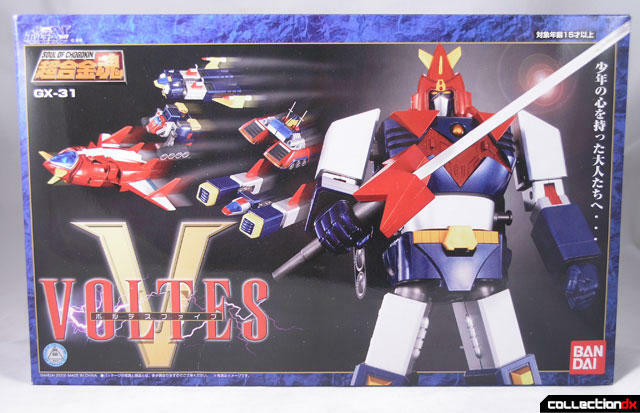 Voltes V comes with sets of open hands, closed hands, and sword holding hands. Unfortunately, the sword is too heavy for the wrist connection and tends to droop a little. Stand – The stand is nothing special – there is a place for each accessory on it, but no nameplate. Some of the accessories, like the Choudenji Strings, the small chrome landing gear, and the blades for the Crewzer, will fall off instantly if you bump it just a little. I think this is the best SOC combiner yet. There are a few things that Bandai could have done better, but they are really small things. I would have liked to have seen more articulation in the head and waist, I would have liked Bandai to do something about the pegs left on the waist, and I wish they were consistant with their use of nameplates on the stands. I am not as surprised about the lack of firing gimmicks. 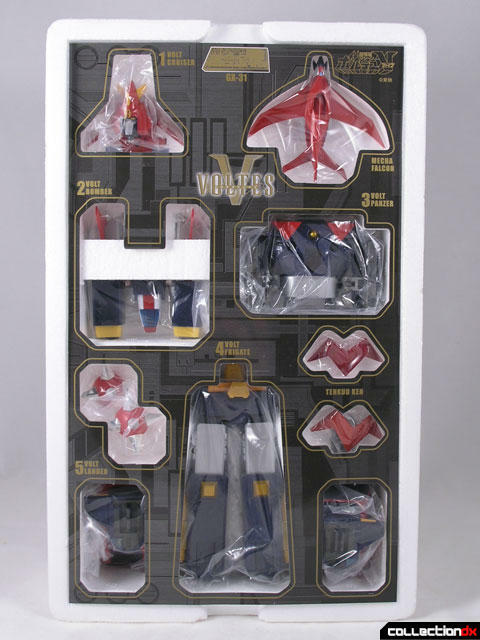 The Soul of Chogokin Voltes V was released May 20, 2006, with a retail price of 16,590 Yen. Loved the video review!! Excellent review. I'd love to see more video reviews! An great start, keep up the excellent work! I loved your video review! I had the original big Voltes V toy as a kid -- and it's nice to see the major improvements on this new one. Just a comment -- those pointy things inside the Volt Lander "hood" are supposed to be drills, so they're not really supposed to shoot out. Again, great review! I'm going out to buy one! The video review satisfied me a lot.That toy is totally AMAZING with its versatility,arsenal,etc...I'm glad I found the website that shows its "moves"(as seen on the video review). Now I wish I could buy one of those in my hometown...OMG!! !NO MONEY,NO CREDIT CARD,NOT A SINGLE ONE AVAILABLE IN MY HOMETOWN,Philippines.Man,how long could I wait for santa to give me one of those? Anywayz,THANKS TO WHOEVER PUT THIS AMAZING TOY REVIEW ABOUT MY ALL-TIME FAV ROBOT CHARACTER, VOLTES V!!!!! Have been looking for this toy (at least, its old variant) since I was a kid. Went to a lot of stuffs since then, but then, you just dont forget this one. just got one a couple of days ago, and another one coming within the next few days. made sure i have a spare and more. just a plain great toy!!!!! could have done with this version. to hold each vehicle into robot mode instead of just snap-ons. arm poses with the sword or without. with the GX-01 when they created and released GX-01R. TENKUU KEN!! V NO NI GIRI!!! hi,had just brought this guy few week weeks ago from my local dealer.had have with it n even get some of the paint chipped.haha,but its ok,cause its a great piece with lot of gimmicks n fun with..good review josh,i buy it because of your review r too good. I finally got my hands on an SOC Voltes V. I was as giddy as a schoolboy getting a really cool Christmas gift. - The toy's design is as faithful and comparable with the animé series. This feature really made my day. - The connecting neckpipe (for lack of a proper term) of bomber 2 could have been a tad longer or had a retractable feature similar to that of the voltes bazooka. - I can't seem to connect the rear landing gears of bomber 2. Can you guys give an explanation and a solution to this? - The connection of the right lander is not as solid as the left's once volted in. - Overall, the toy really rocks. Did anyone get the Voltes Headquarters playset? Did anyone get the Voltes Headquarters playset? The SOC Reideen review today made me realize nobody did a review of the excellent bootleg playset of the Headquarters. Nice quality plastic, lights in the bottom, different parts to display as vehicles or robot mode... It takes the SOC Voltes set from "Amazing" to "Top 3 SOCs ever" status, and really is a must-own if you have this set. I've been "playing" with my Voltes for a few weeks now. Every 2 days, I volt them in, do different poses, then volt them out and display them in v formation. The color scheme of Voltes goes hand-in-hand with my superman collection, even enhances it. I've noticed that as the weeks go by, the volting-in process gets easier. Could this be a feature that Bandai has considered into the designing of their toys? My purchase of the chogokin has surpassed all my expectations. - The weapons showcase is modeled after Camp Big Falcon, the headquarters of the volt machines. I agree with you that Bandai should've been consistent with their labeling of the showcases. - The chain knuckle's meant to punch through a beast fighter, then reel them in closer in order to give it a further beating. In the show, there are 2, one on each arm. - You were commenting on the purpose of the small trapdoor on the cockpit of panzer. Asides from sporting a number 3, it's meant to easily pull out the cockpit upon disassembly of the mecha. - Lastly, I was completely mortified by the way that you haphazardly handled the toy. I take great care when I tinker with my chogokin, so seeing how you handled it shocked me. But at the end of the day, its your toy. nO rESPECT fOR tHE vOLT iN bOX! I still find this original release GX-31 better than the "respect for volt-in box" issue that they will release soon. the deeper and darker blue and red and metallic silver colors give voltes a far stronger appearance - making him look like really a "super robot"...and anime accurate. With the lighter blue like the DX had, he looks more plasticky looking plus with all the label prints all around the body...i don't know...it doesn't work for me at all. These may have gone well for the DX Godaikin during its time but not for the GX-31. Furthermore, if their intentions were to copy the look of the DX version, why are some of the sticker (?) labels different from the DX? They should have just copied exactly what the DX looked like so that it can be truly said "respect for the volt-in box"? This part fell out of my Voltes-V mint out of the box. It was lodged inside the torso #4 Frigate vehicle. I peeked inside the yellow cockpit of the Frigate and saw that there was another identical piece like it, which is like a track for the Cockpit to slide in and out. Before I try and fix this, could anyone with a Voltes-V take a peek and see if there should be two of these pieces inside the torso, or is this a factory flaw I got with an extra piece? Any help appreciated before I try to ram this back in there.